March 4, 2016 – The New Horizons team has discovered a chain of exotic snowcapped mountains stretching across the dark expanse on Pluto informally named Cthulhu Regio. One of Pluto’s most identifiable features, Cthulhu (pronounced kuh-THU-lu) stretches nearly halfway around Pluto’s equator, starting from the west of the great nitrogen ice plains known as Sputnik Planum. Measuring approximately 1,850 miles (3,000 kilometers) long and 450 miles (750 kilometers) wide, Cthulhu is a bit larger than the state of Alaska. Cthulhu’s appearance is characterized by a dark surface, which scientists think is due to being covered by a layer of dark tholins – complex molecules that form when methane is exposed to sunlight. Cthulhu’s geology exhibits a wide variety of landscapes—from mountainous to smooth, and to heavily cratered and fractured. The reddish enhanced color image shown as the left inset reveals a mountain range located in southeast Cthulhu that’s 260 miles (420 kilometers) long. The range is situated among craters, with narrow valleys separating its peaks. The upper slopes of the highest peaks are coated with a bright material that contrasts sharply with the dark red color of the surrounding plains. Scientists think this bright material could be predominantly methane that has condensed as ice onto the peaks from Pluto’s atmosphere. “That this material coats only the upper slopes of the peaks suggests methane ice may act like water in Earth’s atmosphere, condensing as frost at high altitude,” said John Stansberry, a New Horizons science team member from Space Telescope Science Institute, Baltimore, Maryland. 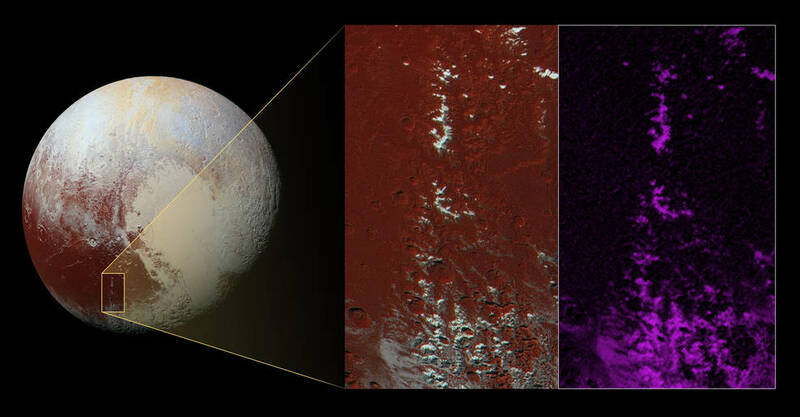 Compositional data from the Ralph/Multispectral Visible Imaging Camera (MVIC) on NASA’s New Horizons spacecraft, shown in the right inset, indicates that the location of the bright ice on the mountain peaks correlates almost exactly with the distribution of methane ice, shown in false color as purple. The resolution of the enhanced color image is about 2,230 feet (680 meters) per pixel. The image measures approximately 280 miles (450 kilometers) long by 140 miles (225 kilometers) wide. It was obtained by New Horizons at a range of approximately 21,100 miles (33,900 kilometers) from Pluto, about 45 minutes before the spacecraft’s closest approach to Pluto on July 14, 2015.